Despite some uncertainty around federal health policy, most experts agree that value-based payment is here to stay. Value-based payment provides a tremendous opportunity for palliative care programs to secure sustainable payment for their services, which evidence shows improves quality and reduces spending. 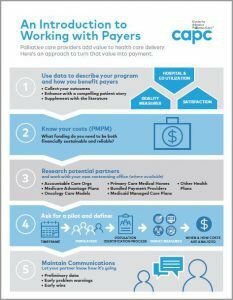 CAPC’s new infographic, An Introduction to Working with Payers, provides a “big picture” framework that can help prepare palliative care providers for payer partnerships. Click the image below to view or download the infographic.